O Blog 'Gosto Disto' faz um ano e eu não podia deixar de postar aqui o giveaway que a Betty esta a realizar. Parabéns para ela! E tu? Participa, quem sabe não ganhas! 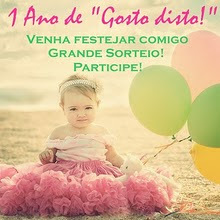 The Blog 'Gosto Disto' is going to be one year soon, so I had to post here its giveaway. Congratulations to your blog Betty! And what about You? Try the giveaway, maybe You'll win!